We are super excited to be doing a Blog Swap this week with our friends over at Xyron. And that means fun giveaways and amazing ideas using both Doodlebug Design producs and Xyron's great adhesives. As an added bonus our Design Team will be featuring ideas with the new PIXIES and how you can use them in your paper crafting. Today Tya Smith rocked it with this darling Thanksgiving Place Setting. So scroll down and see how you can WIN!! Hi there! Tya here with my project featuring a new favorite product of mine. Pixies! If you haven't seen these before - let me tell you - they are sooo fun to work with! If you fell in love with the paper straw trend as I did, I think you will like these little beauties even more! Similar to a coffee stir stick - pixies are perfect for any layout, card or altered project. Today I decided to share with you some place card holders and a napkin ring that would be perfect for your upcoming fall celebrations such as Thanksgiving! I used my Silhouette Cameo machine to cut out the boat and teepee. 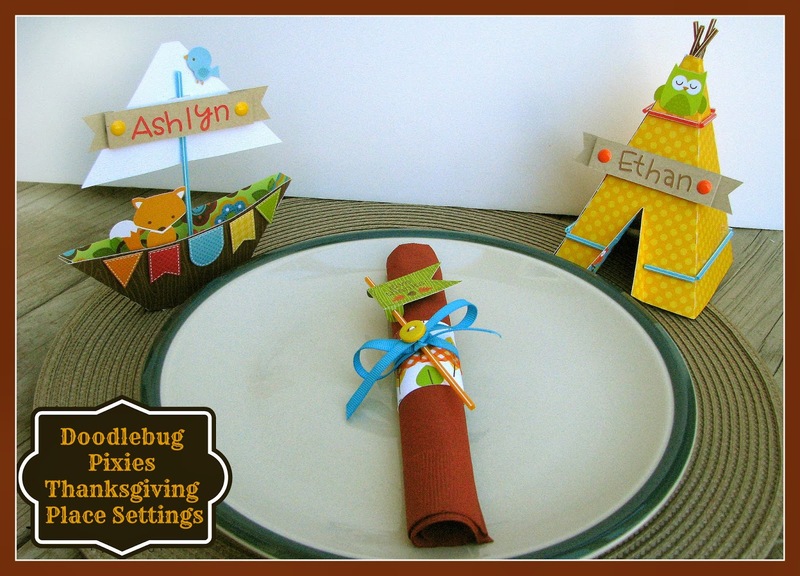 I used these files: 3D Boat and Tall Teepee place setting. Add some banner stickers and a friendly animal sticker and the kids will love the creative way you made their place holder special just for them! The Pixies were also the perfect addition to a handmade napkin ring so I added some pattern paper, a strip of washi tape and a "give thanks" banner from the "Happy Harvest" theme Pixie package. Tie a ribbon and add a button and you've got a beautiful item to add to your table setting! Thanks for joining me today! 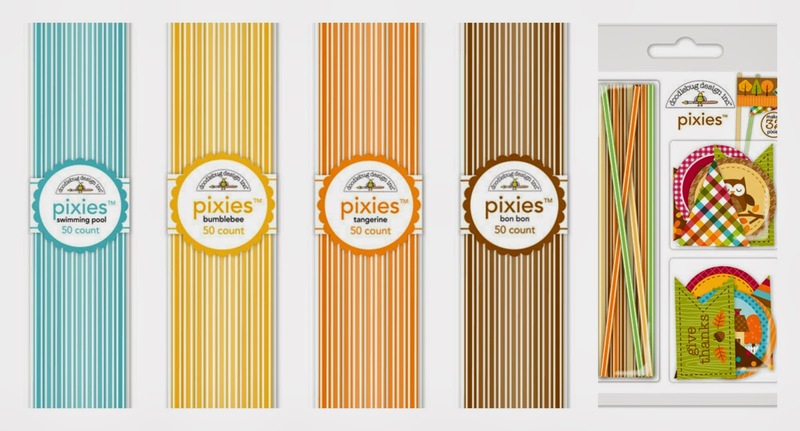 I hope you will take these projects and add your own personal touch to your holiday tables with the awesome new Pixies! We'll be giving away a set of the new Happy Harvest Pixies and Toppers (shown above). All you need to do is SHARE this fun blog post on Pinterest, Instagram or Facebook and leave a comment here on our blog after you do. We'll announce the Doodlebug winner tomorrow on the blog and offer a new giveaway. And don't forget to stop by the Xyron blog to enter to win some fun adhesive products. I shared on facebook!! This is so cute - the boat is ADORABLE!!!! I pinned all these fabulous pictures of Tya's creative genius!! Love it all!! Love the Thanksgiving ideas. Looks like my Sunday School class could make these to take home for the holiday. Pinned (-: Thank you, I did share this post too on FB. Great projects with fantastic patterned papers! table setting! Love the owl. I love all of the cute projects! I shared on Pinterest. These projects are so cute! These are adorable Tya! Love the use of the pixies and the other sticker elements! Love the banner around the edge of the boat and the owl at the top of the teepee. 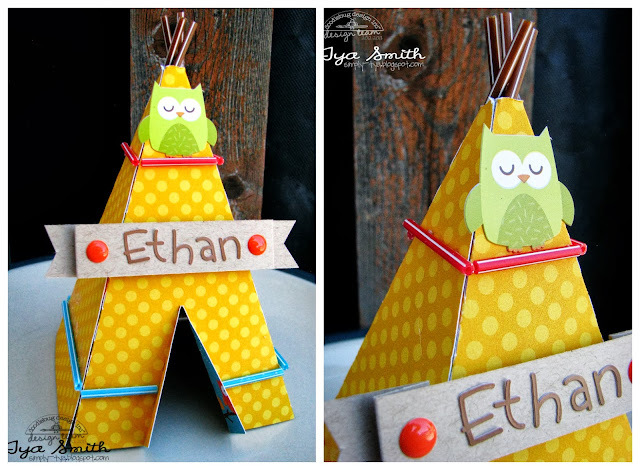 I absolutely love the napkin holder and tepee!!!! What a great idea! pinned and shared on Face Book. Love these ideas. I pinned on pinterest. These are so cute! I am going to have to snag these ideas and use them!!!! Thanks for the chance to win. 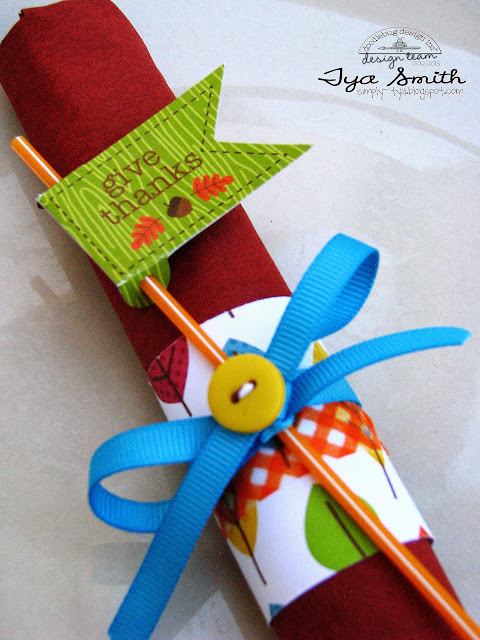 Love these...pinned to my thanksgiving idea page! Pinned this adorable setting! Love your thanksgiving collection!